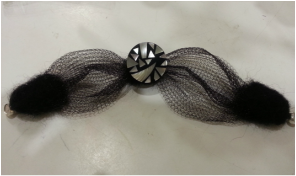 This headband looks like a welted pattern- but surprise! - it's actually ribbed. You can make it narrow or wide – your preference. Also can be seamed at the back or add a buttoned option. You be the designer. It's also double stranded for added warmth. 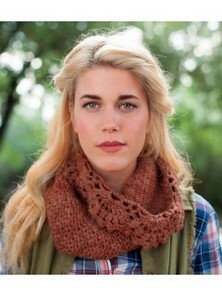 This unique and versatile piece is both a beautiful lace-edge cowl or a slouchy hat when you cinch up the one side. You'll learn the puff and picot stitches and a lace edging. 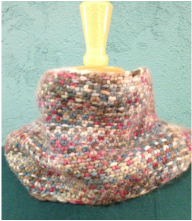 Our sample is out of Monte Donegal which is a lovely kettle-dyed alpaca tweed and the pattern requires a size F hook. Jump on board and ride the latest knitting trend: “Arm Knitting” Let your arms be the needles as you make this quick & chunky eternity scarf. Many yarns to choose from and no knitting needles required. 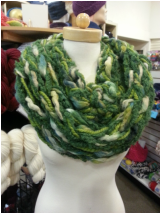 This is a bit of a different twist on a striped cowl as it is knit joining the two colors in the middle of the row. This creates a totally different look. We'll show you how to knit between the two colors without leaving a hole where one leaves off and the other begins. You'll also learn the double moss stitch. 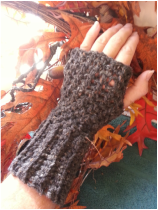 Want to make fingerless gloves for the whole family? These are the mitts for you! Quick and easy, you will have them done in no time. The thumb is so fun and easy, you will be amazed. This is a super easy stitch that will make you look like a genius knitter. We'll alternate 2 colors of alpaca with a slip stitch on a big needle to create a woven look on one side and a seed stitch look on the other side. The result is absolutely beautiful! 2 skeins of Baby Alpaca Grande. This is a quick and easy Christmas gift for someone who always has cold feet! 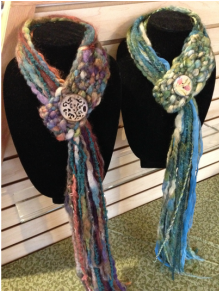 These slippers are a fast knit with the options to add your own little flare or style. You will start knitting the heel back and forth and then join in the round to work the foot. A quick whip stitch at the end closes them and they are ready to wear. Choose a solid color or go Christmas crazy like our sample – either way they will keep your feet toasty warm! We used Caribou fur yarn for that fun Santa slipper look. Learn how to make this hounds-tooth patterned scarf for school events in team colors or as a very cool and classy look in colors of your choice. Hounds-tooth is timeless. This crochet technique makes it also quick and easy. What a great quick gift for just about any female. Boots have become the everyday shoe. These will be reversible so you pick two different colors to work with any boot color. 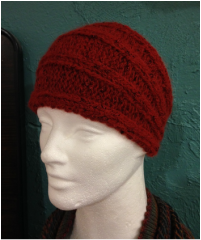 You'll learn how to knit circular on double pointed needles and a new stretchy bind-off. You'll want to make a pair for every color of boot you have and maybe a pair for a few girlfriends or sisters. Quick, easy and so on trend. Make them to match the Brooklyn Fingerless mitts also offered in December. This is a great project when you need to make a gift in a hurry. No knitting or crochet skills necessary. You can make a few in an afternoon. There are so many colors to choose from, too. Still in the fashion spotlight for this year, these crocheted fingerless mitts are also functional in keeping your hands and wrists warm. 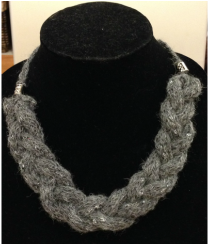 You will be learning an extended single crochet, ribbing and the slip stitch. Materials: We used Tara Tweed in a lovely charcoal heather and completed it with a great button accent. You will need a size G hook. Be right on trend this holiday season and add a little sparkle to your outfit. If you have never made I-cords before, you are in for some fun! They are kind of magic, and come together in a flash.